Standing quietly in Lincoln Park since 1970, the Hampden Green Condominium Association is the best-kept secret along Lake Michigan. 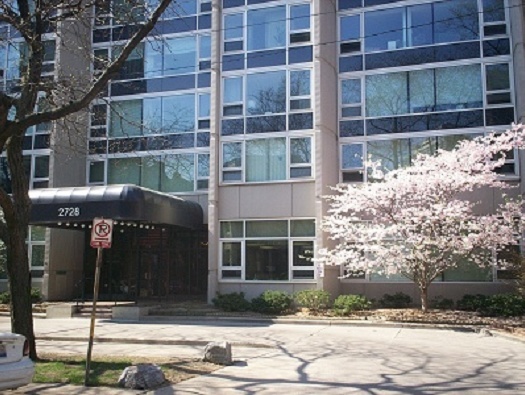 Originally developed as apartments, the property converted to condominiums in 1979. The 205 units all have either Eastern or Western exposures. Private on-site monthly parking adds to the enjoyment of living in the popular Lincoln Park area. The building is made up of one bedrooms, convertibles, and studio units. There are no pets allowed at the Association however amenities include a rooftop pool and sun deck with sweeping views of Chicago, a laundry room, bike storage, saunas, a receiving room, and a hospitality room. Recently the Association replaced their windows and plans are in the works for updating the lobby and hallways. The building has a resident engineer, and a full-time on-site manager, and has an attendant at nights and on weekends. Now that you’re in on the secret, come make Hampden Green your home. If you are a resident at Hampden Green and would like access to the private sections of this web site please click on E-Forms and complete the Login Request Form.